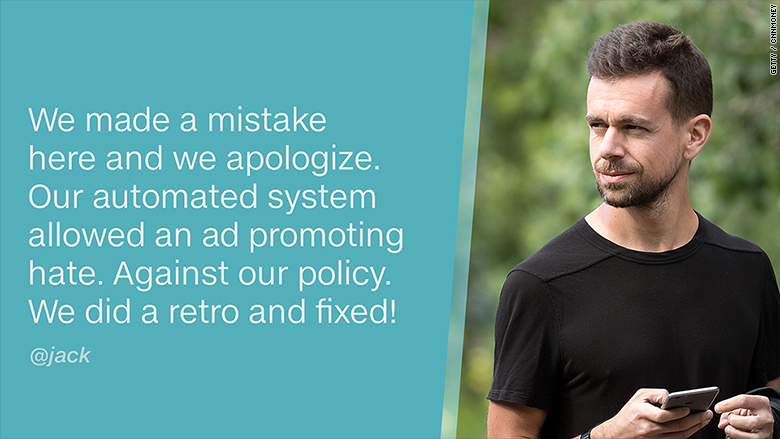 Twitter CEO Jack Dorsey is owning up to mistakes on his platform. 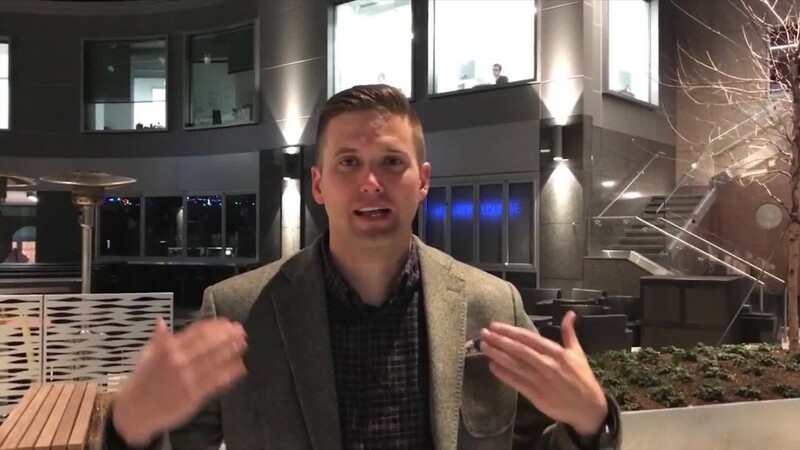 The cofounder tweeted an apology on Thursday for accidentally allowing a promoted ad from a white supremacist group to serve on the site. "We made a mistake here and we apologize," Dorsey said. "Our automated system allowed an ad promoting hate. Against our policy. We did a retro and fixed!" Earlier this week, Los Angeles-based writer and musician Ariana Lenarsky took a screenshot of the ad posted by a white supremacist group, New Order. It linked to an article titled "The United States Was Founded as a White People's Republic." The tweet included the hashtag #WhiteAmerica. "I am shocked and feel stupid for being shocked, but I straight up am shocked," tweeted Lenarsky. Her tweets soon went viral. She urged Twitter to condemn the ad and not take money from the organization. A Twitter spokesman said the tweet was was live for "less than an hour" before it was removed. "We've identified where our process broke down and are making immediate changes to prevent this from happening in the future," the spokesman said in a statement to CNNMoney. "Specifically, we're going to be adding more keywords and image recognition parameters to more quickly flag this type of content for review." The account that tweeted the ad -- @New_Order_1488 -- has also been suspended. Twitter doesn't keep ad dollars from those who violate its polices. The company has also suspended accounts this week from a number of alt-right supporters, who advocate for white supremacy. The news comes as the company recently announced efforts to crack down on hate speech on its platform. It introduced a new reporting tool and an improved mute feature to make reporting hate speech easier. The company updated its policies on hate speech last year, calling it a language meant to "harass, intimidate, or use fear to silence another user's voice." The issue also comes on the heels of Facebook and Google cracking down on fake news publishers on their platforms. The companies announced they're taking new steps to undermine the business model used by fake news publishers and no longer allows fake news sites to use their ad-selling services. The move was made in response to complaints about the volume of misleading internet content shared online during this U.S. presidential campaign. "Twitter doesn't understand its hate problem," billionaire Mark Cuban tweeted at Dorsey. He called its new tools "meaningless." Dorsey defended the update: "Progress; not perfection. We did a necessary reset and now going to improve every day. We're learning faster."